Between the wisecracking cast, the quirky choreography, and the catchy original music, the Disney comedy Shake It Up employs an ideal formula for tween audiences. This—the third soundtrack compilation of tunes from the program—lets fans groove along long after the channel has changed. Characters from the show and other Disney stars (like Selena Gomez, Bella Thorne, and Zendaya) deliver family-friendly facsimiles of chart-topping R&B and dance singles. It also features an extended jam of the show's main theme. OK!! People don't rate these albums bad if you haven't heard them yet. I've heard part of these songs on Shake it Up & I love them BUT I haven't heard ALL of the songs!! Nice album!! Stop rating bad ratings if you haven't HEARD the songs!! To the people who are saying they hate it, it's ONE SONG that's released from it so far. You can't judge an entire album if you haven't heard the entire thing. Yeah, "Contagious Love" isn't my favorite but I still like it. But I've heard previews for "Blow the System" and "Afterparty", and from what I've heard of them they're really good and catchy. I am so excited for the 5th i am Bella and Zendaya's biggest fan! 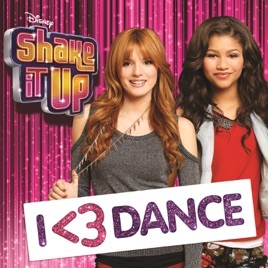 I <3 Dance and Bella and Zendaya!